This comment was picked up by a journalist of an online news site and reported as the headline of a news item covering the conference. However, the journalist also mentioned I hadn’t provided any details to qualify my comments. To my defence, the focus of my speech was not about this topic. Subsequently, in a conversation a week ago with the founder of an US-based AI health start-up, we discussed the multitude of opportunities in using AI enabled health services in developing countries and how few are aware of these opportunities. These circumstances and a reminder from the editor of this site about my promise to contribute an article has now led me to articulate the benefits of AI in health in the context of developing countries. Here, I use India as a typical developing country but many of the processes I discuss can potentially be used in other developing countries. First, let us discuss some of the common issues that health services in developing countries face. A common grievance of health services is the lack of qualified workforce to treat and manage patients. Where health services have qualified personnel, they are overloaded with patients affecting the quality of the service they provide. The other common issue is the urban-rural maldistribution of qualified physicians. The preference of physicians to practice in urban health centres has led to a skewed distribution favouring urban centres and disadvantaging rural communities. In spite of government initiatives to push quality rural health services, the urban-rural divide is to stay. Another prominent issue is the variability in the quality of health services provided in different parts of the country and sometimes within the same region or city. This inconsistency is because of poor monitoring of health services by national accreditation bodies or poor compliance with quality standards by health services. Further, outbreaks of infectious diseases because of mainly environmental reasons has become alarmingly frequent in developing countries. Poor surveillance infrastructure means these outbreaks can progress to epidemics in a span of days. These aren’t the only health system concerns in developing countries but are areas that I think will benefit from the application of AI techniques. India with its massive population of 1.35 billion (2018 population estimate) is in dire need of strong health infrastructure and government policy to service the nation’s health needs. India, just like many developing countries, has significant challenges in delivering this requirement. A combination of increasing burden from chronic diseases, a large ageing population, qualified personnel shortage, urban-rural divide, low government investment in health, inadequate health insurance coverage and variable quality of health service delivery have contributed to this state of affairs. However, the Government of India has been lately active in firming up the health policy and strengthening the health infrastructure. One of the major initiatives of the government was the release of the National Health Policy last year with an aim to reinvigorate the healthcare delivery in India by increasing health spending, establishing national quality standards, promoting evidence-based healthcare and introduction of digital health initiatives. With regards to the latter objective, the intention to set up a National Digital Health Authority and promote interoperable Electronic Health Record systems across India will create a strong foundation for digital health innovations to be applied. This digital platform will also provide opportunities for Foreign Direct Investment (FDI) and contribute to further growth of digital health in India. As digital health initiatives ramp up in India, opportunities for application of AI will also open up. So how would AI applications help the Indian health system? Earlier, I discussed the healthcare delivery challenges developing countries face. The same difficulties apply to India too. AI systems driven by deep neural networks and computer vision have matched accuracy levels of human clinicians in interpreting radiological, fundoscopic and histopathological images. Intelligent agents are also being used to mine data and analyse electronic health records to assist clinicians in the medical diagnosis and predicting mortality of patients. Also, machine learning and natural language processing driven mobile applications are being used to communicate with patients and aid medication adherence, healthy lifestyles and schedule visits to doctors. Further, AI applications are being used in hospitals to predict the length of stay of patients and formulate treatment plans for them. All of these developments are detailed in several academic journals and the media. Application of these agents will have a profound effect on the Indian healthcare landscape, where a shortage of qualified specialists and diagnostic centres abound. While the AI systems may not be able to replicate all the capabilities of the medical specialists, it will in combination with telemedicine approaches be able to increase healthcare access for underserved communities and alleviate the burden of overstretched health services. AI systems can also aid in the improvement of the quality of healthcare by reducing the variability of healthcare delivery and enabling evidence-based practice across the country. By incorporating government sanctioned and thoroughly evaluated AI applications in healthcare delivery, standardisation of healthcare delivery can be achieved. 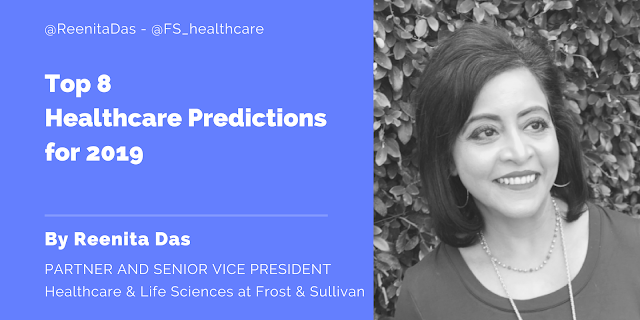 With inconsistency in healthcare delivery and non-evidence-based practices being common in India, roll out of authorised clinical decision support systems that run through machine learning processes will contribute to standardisation of healthcare delivery. Also, AI systems through ongoing analysis of ecological, biogeographical and public health data can alert authorities about outbreaks of infectious diseases and help contain the spread. For example, in recent years machine learning has been used to identify sources of outbreaks. During the Ebola outbreak in Africa, machine learning was used to analyse ecological data to determine the bat species harbouring Ebola virus and contain the spread of the disease. Thus, AI agents can also be used to strengthen India’s communicable disease surveillance infrastructure. While the use of AI applications presents significant promise for the Indian healthcare system, one has also to be cognizant of the challenges in applying AI approaches. AI applications rely on a robust digital health foundation including ongoing access to electronic patient data and patient/population information management systems. With the Indian digital health infrastructure being nascent at best, widespread roll-out of AI applications can be a challenge. Also, with the low number of qualified health informaticians, machine learning trained data scientists and AI focused entities in India, there may be increased reliance on overseas companies to support the roll-out of AI applications. There are also issues like bias, lack of contextual reasoning and explainability problems that accompany AI applications. However, with advances in AI technology some these issues have now been addressed with number of solutions available. To harness the benefit of AI approaches, the Indian government has to formulate a definitive AI strategy. A strategy that amongst many other things outlines the regulatory framework and implementation strategy for the roll-out of AI in India. The immense benefits that come through application of AI can be only be realised through the boldness and proactiveness of the Indian government. 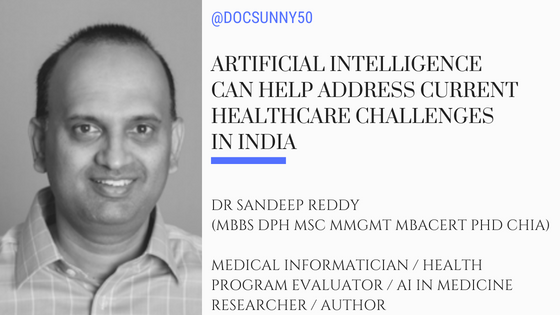 By pushing forward a national AI strategy and setting up an AI enabled healthcare delivery system, India can be a leading example for other countries as to how critical healthcare challenges can be addressed through AI approaches.